Mold. You may not be able to see or smell it, yet it may be growing in your home and the reason you feel sick. Mold poisoning may be impacting your health. How do you know? In this blog, I want to cover mold illness and who is susceptible. In future blogs, I’ll cover what to do about it. Most likely your regular doctor won’t be much help. Conventional medicine doesn’t really believe that mold exposure is a problem. Plus it can be difficult to diagnose someone with mold toxicity; it can mimic many other conditions and symptoms are nonspecific. See how easily mold poisoning could go unnoticed, or mistaken for other conditions? Yet 30 years of good scientific evidence points to the serious health problem that mold can cause. So, what is mold? Molds are multiple types of fungi that grow in filaments and reproduce by forming tiny spores that sprout and fly away, invisible to the naked eye. Mold grows in damp, warm, and humid locations, inside and outside. Even if you live in a dry location such as Arizona or Nevada, mold can be a problem if there are water leaks, poorly ventilated bathrooms, or floods. Would you believe that half of buildings in the United States are water damaged, leading to the growth of mold and the potential for mold illness in susceptible individuals? Given that most of us spend significant time in a home and indoor workspace, there’s a good chance you’ve been exposed to water damage and mold. When you buy a home, the inspector includes mold problems on the house report—obviously, it’s not a good thing. That science moment may have made your eyes glaze over, so consider this comment from Dr. Shoemaker: “24 percent of people cannot make adequate antibody responses, and they’re the ones that comprise over 95 percent of people who have an illness from water-damaged buildings.”3“Transcript – Dr. Ritchie Shoemaker: Surviving Mold – #126,” Bulletproof, accessed December 1, 2015, ...continue That leads us to our next topic, which is the role of your DNA in making you more or less susceptible to mold illness. As mentioned by Dr. Shoemaker, approximately 24 percent of the population is genetically vulnerable to mold toxicity; they have a certain immune response gene (HLA-DR). If you’re one of those people with mold susceptibility genes, you are far more likely to have an adverse reaction to mold when exposed to a sufficient quantity. In fact, 95 percent of mold illness occurs in this subgroup. Additionally, there’s 2 percent who are particularly susceptible with a “sicker quicker” variation of the genes. If you aren’t susceptible, your chances are lower but not zero. 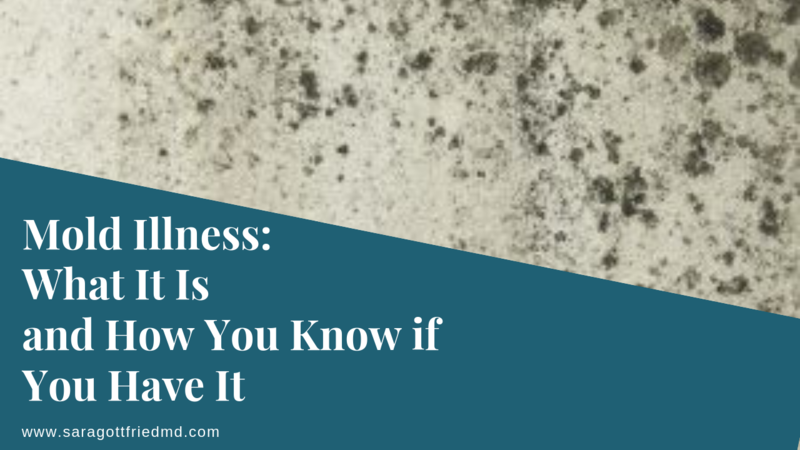 People like me who are genetically mold susceptible aren’t able to recognize specific toxins as toxins, such as mold, and the toxins get recirculated in their bodies. As a result, the toxins, in this case mold, trigger a persistent inflammatory response. Most of these folks don’t know that they have a genetic susceptibility. Mold illness from water-damaged buildings is a serious health problem.4Dennis, D. P. “Chronic sinusitis: Defective T-cells responding to superantigens, treated by reduction of fungi in the nose and ...continue It’s not an allergy; it’s a state of chronic inflammation caused by the immune system becoming out of whack. The CIRS doesn’t heal on its own, will not abate, and will continue to provoke illness unless it’s treated. Their illness is built into their DNA and once triggered, the inflammatory response and resulting symptoms can last for years. 1. History, signs, and symptoms consistent with biotoxin exposure. In cases of mold toxicity, history should include exposure to toxin-producing molds as documented by the EPA-approved ERMI test. In other cases (microcystin, ciguatera, etc. ), history should include likely exposure or laboratory evidence of exposure. 2. A genetic predisposition to biotoxin-related illness based on identification of an HLA susceptible haplotype. 3. Abnormalities documented by Visual Contrast Sensitivity (VCS) testing. 4. Biomarkers consistent with the neuroimmune, vascular, and endocrine abnormalities that characterize CIRS. If you have a history consistent with biotoxin exposure, a susceptible genotype, and an abnormal VCS test, you are very likely to show the laboratory abnormalities seen in CIRS. Major and minor criteria are a work in progress. If you suspect you may have a problem with mold, I suggest the following steps. Step 1. Start to learn about mold illness. Start with Dr. Shoemaker’s excellent website and book, Surviving Mold. Step 2. Test your home for mold. One of the best tests is called an ERMI, and I suggest that you hire an environmental professional to perform a visual inspection of your home and sample several rooms. You can perform an ERMI on your own at a lower price (about $325) but it’s only helpful if it’s positive, in which case you’ll need to hire an environmental professional. So I suggest skip the self-testing. Step 3. Work with a clinician trained in the Shoemaker Protocol. Click here for more information on how to find one. You may consider the genetic susceptibility test for mold, which can be performed by Labcorp, panel # 167120. In the next part of this series on mold illness, I’ll describe what happened when I tested my own home for mold. Then I’ll address remediation and what’s proven to help a person heal from mold illness. Do you have symptoms of mold illness? Do you know or suspect you live in a water-damaged building? We would love to hear your story. Let me know in the comments below. 2. ↑ Brewer, J. H., et al. “Chronic illness associated with mold and mycotoxins: is naso-sinus fungal biofilm the culprit?.” Toxins 6, no. 1 (2013): 66-80. 4. ↑ Dennis, D. P. “Chronic sinusitis: Defective T-cells responding to superantigens, treated by reduction of fungi in the nose and air.” Archives of Environmental Health 58, no. 7 (2003): 433-441; Dennis, Donald, David Robertson, Luke Curtis, and Judson Black. “Fungal exposure endocrinopathy in sinusitis with growth hormone deficiency: Dennis-Robertson syndrome.” Toxicology and Industrial Health 25, no. 9-10 (2009): 669-680; Rea, W. J., et al. “Effects of toxic exposure to molds and mycotoxins in building-related illnesses.” Archives of Environmental & Occupational Health 58, no. 7 (2003): 399; Campbell, A. W., et al. “Mold and mycotoxins: effects on the neurological and immune systems in humans.” Advances in Applied Microbiology 55 (2004): 375-408; Gray, M. R., et al. “Mixed mold mycotoxicosis: immunological changes in humans following exposure in water-damaged buildings.” Archives of Environmental Health 58, no. 7 (2003): 410-420; Kilburn, K. H. “Neurobehavioral and pulmonary impairment in 105 adults with indoor exposure to molds compared to 100 exposed to chemicals.” Toxicology and Industrial Health (2009); Empting, L. D., “Neurologic and neuropsychiatric syndrome features of mold and mycotoxin exposure.” Toxicology and Industrial Health 25, no. 9-10 (2009): 577-581; Park, J. H., et al. “Mold exposure and respiratory health in damp indoor environments.” Front Biosci (Elite Ed) 3 (2011): 757-71; Fisk, W. J., et al. “Association of residential dampness and mold with respiratory tract infections and bronchitis: a meta-analysis.” Environmental Health 9, no. 72 (2010); Park, J. H., et al. “Rhinosinusitis and mold as risk factors for asthma symptoms in occupants of a water‐damaged building.” Indoor Air 22, no. 5 (2012): 396-404; Terčelj, M., et al. “Fungal exposure in homes of patients with sarcoidosis-an environmental exposure study.” Environmental Health 10, no. 1 (2011): 8; Laney, A. S., et al. “Sarcoidosis, asthma, and asthma‐like symptoms among occupants of a historically water‐damaged office building.”Indoor Air 19, no. 1 (2009): 83-90; Chester, A. C., et al. “Concurrent sick building syndrome and chronic fatigue syndrome: Epidemic neuromyasthenia revisited.” Clinical Infectious Diseases 18, no. Supplement 1 (1994): S43-S48; Brewer, J. H., et al. “Detection of mycotoxins in patients with chronic fatigue syndrome.” Toxins 5, no. 4 (2013): 605-617.